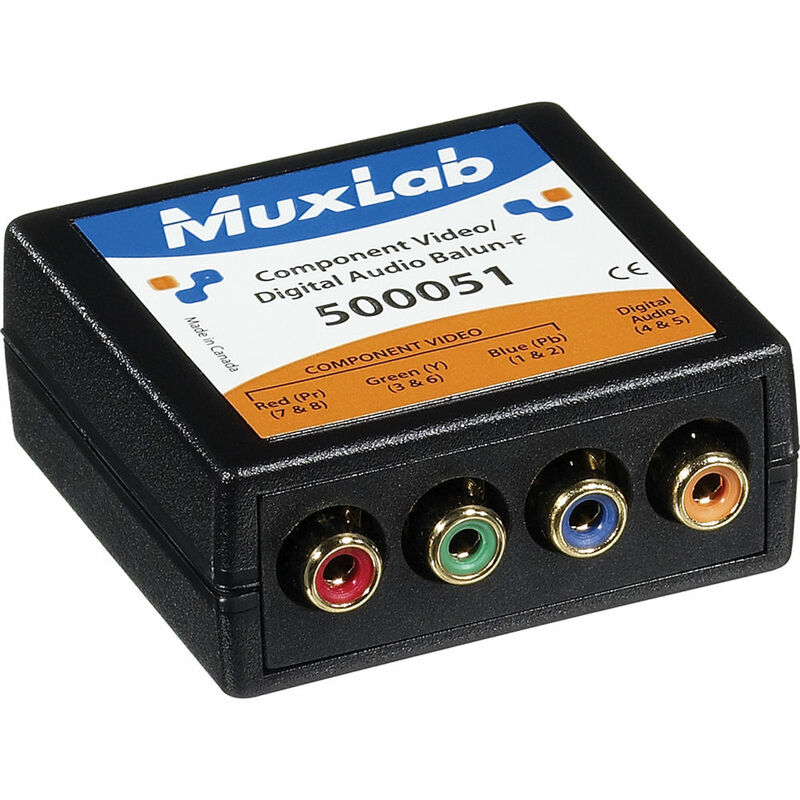 The MuxLab Component Video/Digital Audio Balun (Female) allows transmission of a component video (YPbPr or RGB) signal and a digital audio signal using Category 5E/6E/6 twisted pair cables. When used in pairs, the Component Audio Balun supports applications that use 480i/p (up to 1000'), 720p, and 1080i/p (up to 500') HDTV (hi-definition) video. It transmits digital audio at a maximum distance of up to 600' (182m), and offers support for digital audio on a fourth twisted pair. The balun also features molded color-coded RCA cable leads and modular shielded RJ45 connectors for an easy attachment. The Component Audio Balun is housed in an ABS fire retardant plastic. Besides using Cat 5E/6E/6 as a cost-effective alternative to coaxial cabling, the balun also makes changes or additions to outlet connections faster and easier. Providing a hassle-free cabling solution, the balun connects to DVD players, satellite receivers, plasma displays, projectors, monitors, up-converters, amplifiers, switchers, home theater, and other equipment supporting HDTV component video and/or digital audio. Box Dimensions (LxWxH) 5.4 x 2.8 x 0.5"
Can this balun be used to transmit composite video as well?